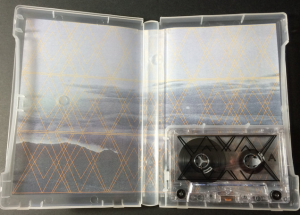 Amulets latest release “Twin Symmetry” is available on cassette through Pirate Ship Records. Randall Taylor, the Austin, Texas based artist behind Amulets creates a unique sound, blending elements of ambient, drone and noise with sound clips of crisp, melodic instrumentals balanced by reverberating feedback resulting in a harmoniously discordant and eerily beautiful composition. Aside from the elegantly unusual sound of “Twin Symmetry,” what also sets it apart is the actual creation process. Aptly named, “The Suitcase of Drone,” the Amulets artist’s entire setup is housed within a suitcase, making the process of fusing sound, cassette manipulations, circuit bending and looping all the more fascinating and creating a visual juxtaposition to match the one created by the atmosphere of the music as well, a blend of futuristic elements with an air of nostalgia. Each track on “Twin Symmetry” blends effortlessly with the next, creating a seamlessly enveloping sound experience for the listener which is perhaps one of the most alluring qualities that ambient or drone music posses; able to be played in the foreground as the centerpiece of a moment and equally fitting as the background soundtrack of hours passed with the album on loop. For any fan of ambient, drone or experimental music, Amulets’ “Twin Symmetry” commands a listen.